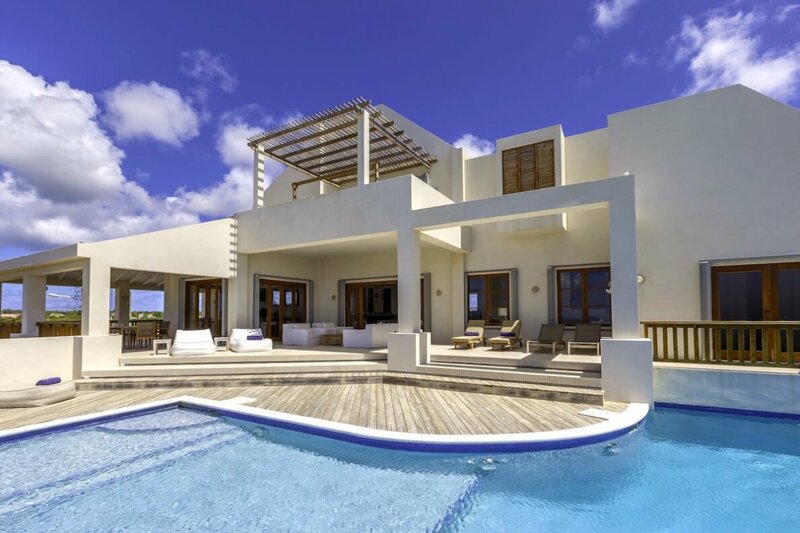 Villa Colibri has a sleek and modern design that belongs on a magazine cover. There’s a swimming pool with different depths that any swimmer can enjoy, tons of outdoor space, and space to lounge in the sun or shade. Villa Colibri provides a wonderful haven for several families to come vacation together, especially those who want a kid-friendly getaway. Even the gardens have a small fenced area for the kids to enjoy some outdoor fun. Great value for 4 couples or a family! Colibri is a spacious, sunlit villa near Dropsey Bay. This gated property is ideal for young children and couples alike. A wooden patio borders the L-shaped pool, which has varying depths for guests of all ages. There’s loungers on the patio and a shaded living area under the veranda. Gardens surround the property, and there’s a walled-off, gated play area amidst the foliage. Upstairs, there’s a dining balcony with a grill and a foosball table as well as a bedroom balcony with a hammock. The deck, veranda, and balconies have ocean views that stretch to St. Martin in the distance. Workouts are easy in the air-conditioned gym thanks to the treadmill, bike, rowing machine, and weights. The media room and game room also keep guests entertained. The interiors feel casual, and are decorated with Caribbean artwork and both designer and locally made furniture. Sliding glass doors lead from the veranda to the living area, which has a large sectional, a TV, and access to the front porch. This space stretches across the length of the villa and blends with the dining room and kitchen. The dining room seats six, and the kitchen has chic concrete countertops, stainless steel appliances, and a breakfast bar. All six bedrooms are ensuite and air-conditioned, and fans exist throughout the house. On the upper level, there’s an expansive master bedroom with a balcony, a dressing room, a bathroom with a huge shower and tub, and a large 7x7 king bed. It has its own vanity area and lounge as well. On the first floor, the spacious north suite has two twin beds that can be spread apart for siblings or zipped together for a couple. The first floor also has a south suite with a king bed, and the main level has a two twin beds than can be zipped together for a king size bed. In-laws, teenagers, or extended family members will love the privacy and amenities in the Garden Cottage. The cottage consists of a kitchen, a dining room, and two ensuite bedrooms. The bedrooms are separated by a courtyard with an outdoor dining area. One suite has a four-poster king bed and the other has two twin beds that can be made up as a king. The entire property is maintained by a housekeeper, gardener, and caretaker. Colibri Villa guests have signing privileges at CuisinArt Resort and Spa, except during the Holiday Season. Colibri can be rented with the neighboring villa, White Cedars, for a total of nine bedrooms. The villas are only a five-minute drive from Sandy Hill Bay’s half-mile beach. pool size 45 ft. X 14 ft., Varying depths to accommodate everyone. The pool can be heated for an additional fee. Seven minute drive to Sandy Hill Bay Beach. Signing privileges at CuisinArt Golf Resort and Spa with a reservation for a day use room. Heated pool at $90/day. Car rental, private chef, butler, server, grocery and beverage shopping (pre-arrival and during your stay), liquor and wine delivery, nanny service, baby equipment, spa services, yoga and personal training, photography, and private airport transfer/car service can be arranged for an additional fee.